Following his performance against the No. 17 team in the country, Ball State linebacker Ben Ingle has been named the Mid-American Conference West Division Co-Defensive Player of the Week. 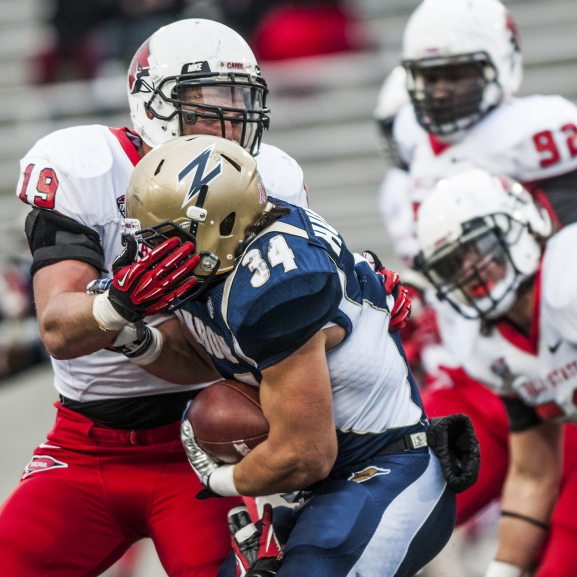 Ingle recorded a season-high 13 tackles, seven of which were solo-tackles, in the 24-19 loss at Northwestern. He also led the game in tackles for loss with two and finished with one pass breakup. The Cardinals' defense forced three turnovers in the first half against the Wildcats on Sept. 26, leading to a 10-7 halftime lead. Ball State head coach Pete Lembo called it a "gutsy" performance by his defense. Lembo knows what Ingle provides for the Cardinals defense. "Ben brings a lot to our defense in terms of focus and leadership... He practices hard everyday so there's a lot [that] younger players can learn from him," Lembo said. "It's good to see him having some success this year." Ingle is second on the team with 30 tackles so far this season. He has three tackles for loss to go along with three pass breakups. The award marks the first time this season a Ball State football player has won a MAC weekly honor. Ingle shares the award with Toledo defensive tackle Orion Jones. The Cardinals are set to face off against the 3-0 Toledo Rockets team who currently ranks just outside the top-25. The Rockets finished last season with nine wins, including a 63-44 win over Arkansas State in the GoDaddy Bowl. Ball State will take on Toledo on Oct. 3 at Scheumann Stadium for homecoming.